We are a leading company, specialized in the fabrication and extending a wide choice of Pipe Beveling Machines that are extensively made use of for the purpose of beveling the pipe end. Widely demanded in various industrial applications, our manufacturing facility is capacitive to accomplish the bulk requirements from our clients. We offere a wide range of Beveling Machines are designed to bevel 30° or 45° weld seams on steel, stainless steel, nonferrous metals, brass and plastics. They can also be used to deburr and chamfer; straighten edges, internal and external radii and countersink holes from 7/8" diameter. We are offering a wide range of Bevelling Machine, this preparation of weld edge is required before welding in fabrication workshops, boiler constructions equipment, shipyards, pipeline, tank, heat exchanger and machinery manufacturers etc. The beveling operation by this machine is superior, cheaper and faster than any other methods such as flame cutting. 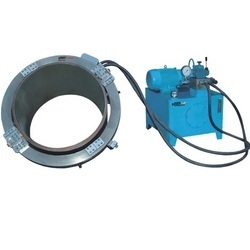 We offer a wide range of Pipe Beveling Machines which is slide into the open end of the pipe. A draw nut is tightened which expands the mandrel blocks up a ramp and against the I.D. surface for positive mounting, self centered and squared to the bore. As the tools bit is fed into the material from the end, a bevel is produced which conforms to the angle predetermined by the angle ground into the bit. Bits are available for practically and material or beveling angle required, and bits can be custom made for any form tooling operation. 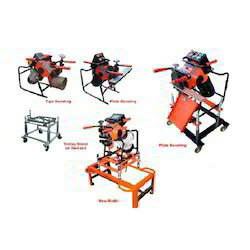 We offer a distinct range of Cold Pipe Cutting Beveling Machines. The split frame design of the equipment allows the machine to separate and mount around the O.D. of the in-line pipe or fittings for strong, stable clamping. 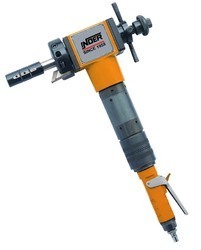 The equipment perform precision in-line cut or simultaneous cut / bevel operations, as well as weld end preparation and counter boring on open ended pipe. The application of the machine is at Nuclear power, Fossil fuel / Power, Oil and Gas, Fabrication / High Purity, Process Plants and Ship Repair.